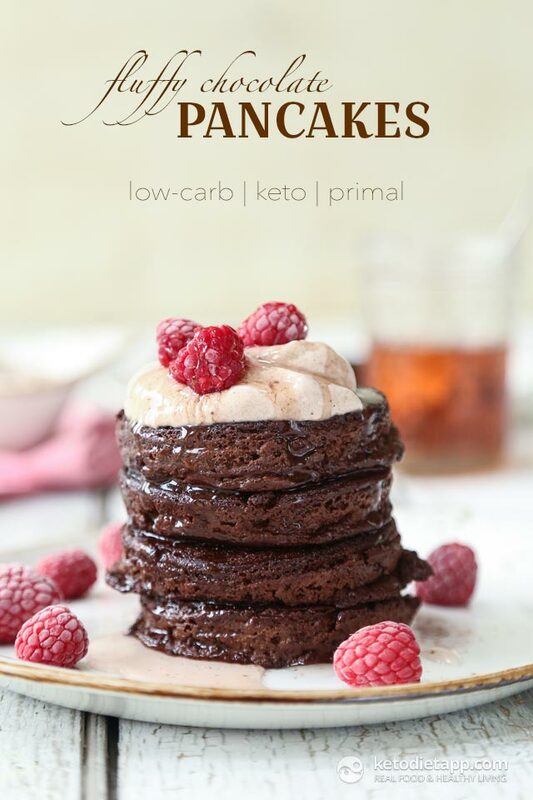 These amazing low-carb pancakes are sugar-free, grain-free and nut-free. Like in my other keto pancakes, I used ricotta cheese to make them fluffy and soft inside, and crispy on the outside. 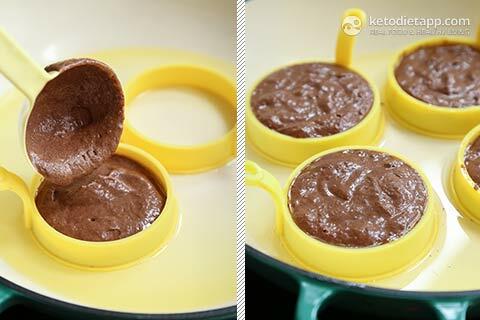 Make them in batches and freeze for a quick keto breakfast or treat. Macronutrient ratio: Calories from carbs (8%), protein (21%), fat (72%). Instead of Erythritol, you can use other healthy low-carb sweeteners from this list. 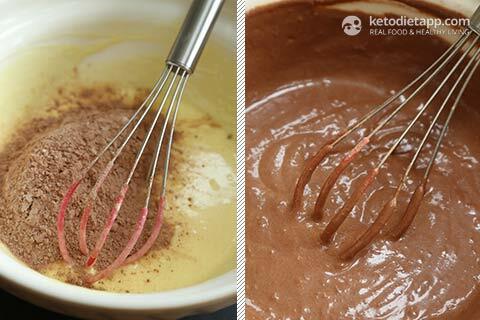 Mix the dry ingredients: cacao powder, Erythritol, cream of tartar, baking soda and vanilla powder (or cinnamon). Note: Cream of tartar and baking soda act as leavening agents. 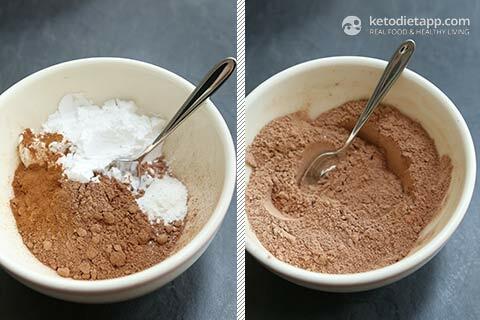 This is how it works: To get 2 teaspoons of gluten-free baking powder, you need 1/2 a teaspoon of baking soda and 1 teaspoon of cream of tartar. Instead of this mixture, you can also use gluten and aluminum free baking powder. 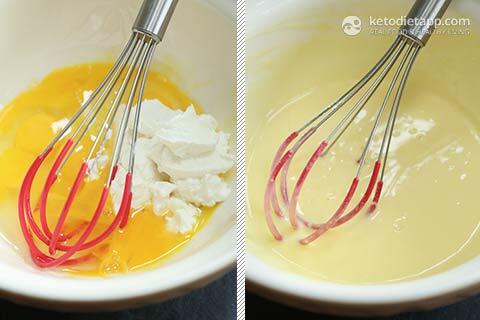 Crack the eggs into a bowl, add the ricotta cheese, and beat using a hand whisk. Grease a pan with some ghee or coconut oil and once hot, using a spoon or ladle, create small pancakes. You can use pancake molds like these to create perfect shapes. Cook on low-medium heat for about 5 minutes until the top of the pancake starts to firm up and you see bubbles forming on top. Then, remove the pancake mold (if used), and flip on the other side. Cook for another minute just to crisp up. Repeat for the remaining pancakes and grease the pan as needed. Enjoy with your preferred toppings or let them cool down and place in the fridge in an airtight container for up to 5 days - or freeze for up to 3 months. 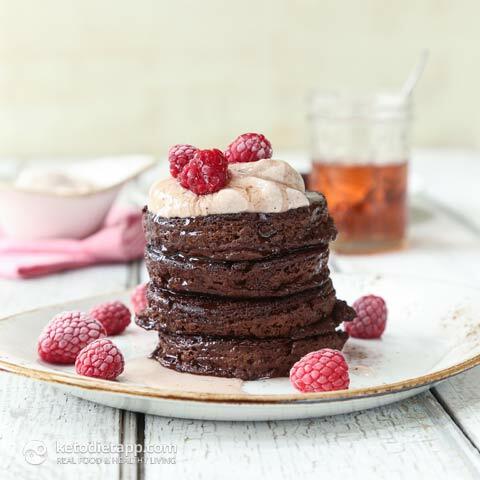 You can optionally serve the pancakes with full-fat yogurt, sour cream, berries and sugar-free syrup. Apart from sugar-free maple syrup, you can make any flavours you like. I made cherry syrup using Sukrin Clear syrup and cherry extract. I made this today it did not get as fluffy but I think I will be getting the molds for next time as they were really good. I made a peanut butter fluff with organic peanut butter, ricotta, and stevia. It paired so well with these pancakes. Thank you for the recipe. Any substitute for full-fat ricotta cheese? 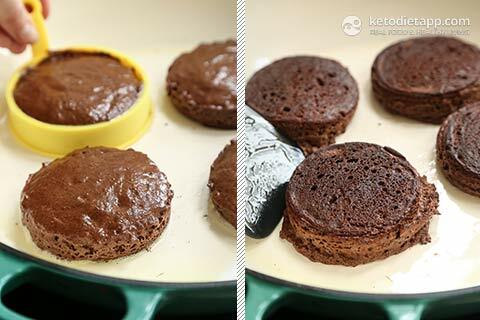 With some tweaks - you could replace some of the almond flour with cacao powder. Can you bake these into small cupcakes? If so how long and can you freeze them? Perfect for a snack when missing your treats. Once the cool down, you can keep them in the fridge or freeze in an airtight container. These sound awesome! 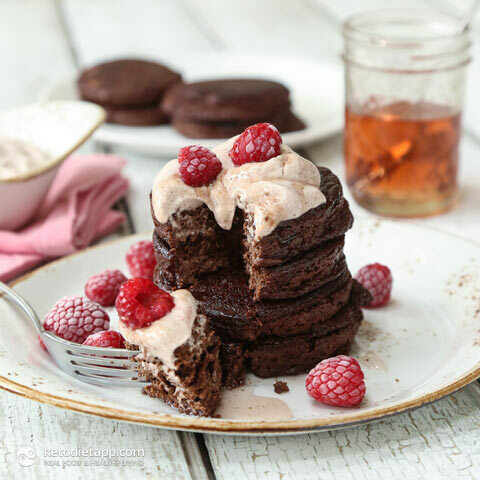 Have you ever used coffee flour for any of your recipes? I just saw some on nuts.com and it looks very healthy. The thickness of these pancakes are REAL! OMG I love when pancakes are fluffy and contain chocolate! YUM! I was just curious, is there any way to make them dairy free? These sound wonderful, but several in our family can't have dairy!